Fall Apple Cocktails. From left to right: Sweet Orchard, Apple Ginger Sparkler, Caramel Apple-disiac, Apple Temple, Apple Lemon Fizz and Apple Pie Shooter. Today was the day to start my first set of experiments – apple drinks. All the prep work was out of the way, all my ingredients laid before me. The ham and baked potato was in the oven, the potatoes peeled and ready to cook. First on my list: something called The Orchard from Saveur which would use two of my new infusions. Pulling out the Apple Jack Syrup Infusion and All Spice Dram Infusion, grabbing a lemon and a rather expensive bottle of maple syrup (yep more sugar, you can see where this is going) I mixed up the first tester and just to be scientific… the original recipe (gotta know what your aiming for). WoW! Sweet like eating candy!! And instant sugar rush. Ok, so I can work with this, the trick is how to cut the sweetness without diluting the taste – which was splendid. The original does this with the … you guessed it… booze. After some research I discovered that the mixologist secret for a sweet drink is bitters. Well that’s great, except these are hard to come by and also booze. What do to… more research of course! And a solution, cider vinegar. Testing this on my two kids proved to be successful, the drink maintained their required sweetness but added a bit of brightness and that bitter taste that helps cut the sweet just enough to make the drink come alive. Mix all ingredients in a cocktail shaker, fill with ice and shake well to break up syrups. Strain into a glass and serve. When I offered this to my kids the first thing they said was “can you make this again, lots?” As far as simplicity, once you have the two specialty ingredients made up, it’s a cinch. While this is a wonderful recipe, it’s more of a sipper due to it’s sweetness. Consider this a desert drink, maybe with some wonderful cheese. Ingredient finding: 4/5 All spice berries not available locally here, had to get from out of town. Here are the recipes for the two specialty syrups. For more details see my previous blog. Dissolve sugar in water, add apples and simmer until tender about 10 minutes. Apples should become translucent. Add cinnamon and simmer 5 minutes. Remove from heat and pour into mason jar, add 2 tablespoons brandy extract and let cool completely before sealing and storing. Let sit overnight or as long as you want in fridge. Boil water and spices and simmer 10 minutes. Let steep half hour. Strain and add sugar. Heat to dissolve sugar, remove from heat and add rum extract. Cool and store in fridge until needed. Next to tackle – another drink that required some form of bitters. Since this was not something I had originally prepped, back to the research and the grocery store for the most bitter of citrus: Grapefruit. Most bitters involve some form of bitter herb as well as some flavouring agent. I chose to pair the flavour and bitterness of grapefruit peel with the essence of thyme and a touch of lemon and vinegar for some bite. The results turned out perfect and the recipe is a snap to make. Zest and juice lemon into blender, cut skins off grapefruit, chop coarsely and put in blender with half of grapefruit flesh, add remaining ingredients and pulse until blended. Turn to high speed and pluse a few times more. Pour into storage container (plastic is fine) and refrigerate overnight. Next day, strain with a fine wire mesh strainer into a bowl and discard pulp. Keep liquid refridgerated until use. The original for this next drink comes from Bonappetit. Known as the fall classic, this martini used bourbon and brandy for it’s kick. In order to create something new and exciting without simply being another sparkling apple cider I added a splash of grenadine, and worked with as many fresh flavours as I could. The result is not a perfect replica of the original, but hints at some of the flavour components, while being available for any palate. Measure first 5 ingredients into a cocktail glass. Add ice and shake well to blend flavours and chill the drink. Rim a chilled champagne glass with sugar. Pour cocktail into glass and add soda water to top up. Add a splash of grenadine just before serving, and let it sink to the bottom for effect. This is lovely and refreshing, the thyme and citrus add a nice touch but the grenadine may not work with this flavour complex. Alternates would be to make a red apple syrup and use that to keep the flavours more pure. Quarter the apples, with skins on, cut out the cores and chop into thumb size bits. Fill blender with apples and add lemon juice. Start blender on lowest setting, chop by pulsing until apples are finely chopped. Turn to next setting and blend until the apples are moving freely through the blades without help. Increase speed and continue until you get to top speed and the apples are pulp. Pour apples into strainer over the bowl, and use the back of your wooden spoon to push and squeeze all juice out of the pulp. This recipe proved to be the most challenging to get close to the original four at cosmopolitan.com. When creating a coffee liqueur replacement, the concentration of coffee per tbsp of syrup becomes double what would be found in the most common coffee liqueurs. So, when I created this recipe using the same concentrations of each ingredient and compared it to the original I found the taste of coffee in the virgin drink too overpowering – you couldn’t taste the apple at all. In altering the recipe, it soon became apparent that additional ingredients would be required to add depth and richness. After about 6 tries, I finally came up with something that is very close to the original in flavour, but milder in kick. Measure all ingredients into cocktail shaker with ice. Shake well and strain into martini glass. Garnish with a slice of apple if desired. This is an acquired taste. With the addition of carmel and decrease in amount of coffee flavour, my non coffee non drinker husband found the drink more enjoyable and finished the glass. My kids however do not like this, due to the richness of the flavours. I made this for a few relatives this thanksgiving at dinner – one thought there was banana in the drink due to the way the flavours mix. She said “I taste about five things at once in the first sip”. Do these flavous work together, the veridic is still out with my family. Taste: 3/5 as not everyone will love this. Heat coffee and sugar in sauce pan until sugar dissolves. Remove from heat and add vanilla. Bottle and keep in cool place until needed. Boil water and have measured and ready. Heat sugar in sauce pan on medium heat stirring regularly. When sugar starts to melt it will caramelize, keep stirring just until sugar is almost all melted. Remove from heat and carefully pour in hot water. The sugar will sizzle and pop from the water and the results will be a ball of toffee and some caramel tasting water, don’t worry. Return to heat and dissolve toffee sugar in water until the results are a thick dark rich syrup. IMPORTANT: Hot melted sugar will keep on cooking and burn quickly if you don’t work quick, don’t let the sugar start to boil and bubble this means it’s burning. YEP, this took me two tries to get it right. Feeling overwhelmed? Don’t worry, choose one drink and enjoy. Then when your ready, try another. This is the first three apple options I created this holiday season – and the most difficult. 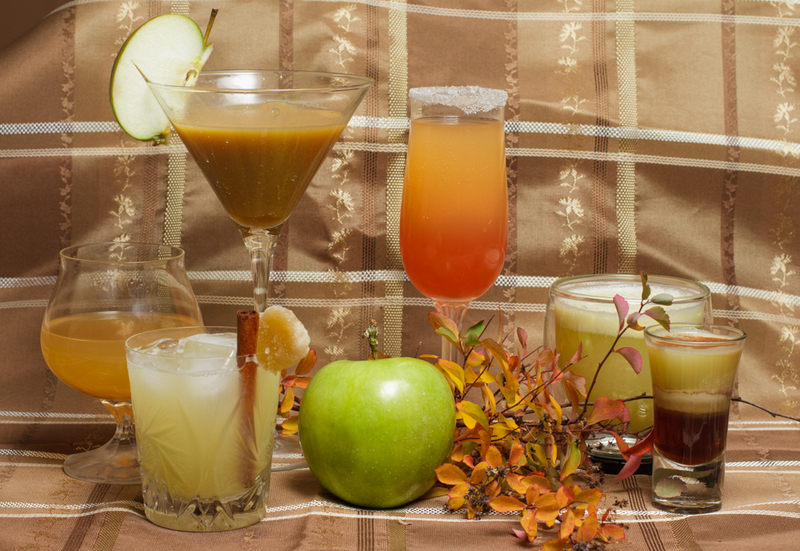 My next blog will be the other three : Apple Pie Shooter (virgin), Apple Lemon Fizz and Apple Ginger Spritzer. Posted on October 13, 2014 October 13, 2014 by orionssong	This entry was posted in Bitters, Cocktail, Virgin martinis and tagged apple, caramel, coffee, grapefruit, kid friendly, sweet. Bookmark the permalink.